Using the :last_measurement_time bind parameter can be perplexing especially for dimensioned metrics. Read on to understand how the system applies the bind parameter across dimensions during data collection. 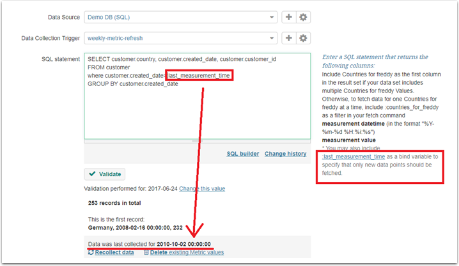 For metrics, you must specify the time period you are collecting data for in the query. For example, if you state the exact time period in your where clause, like <where date_time between ‘2017-07-01’ and ‘2017-07-07’>, the system fetches data for the period specified. However, you cannot use exact dates when collecting data going forward at set intervals. To handle this dynamically, the :last_measurement_time (LM) bind parameter is used to structure a query in MI to collect data going forward, without specifying exact dates. This bind parameter represents the last date collected by MI that is stored in the system database. For undimensioned metrics, the LM always represents the last date Metric Insights has collected data for. That’s simple enough. However, for a dimensioned metric, the last date collected for may vary across dimension values. The LM can either be the oldest date across all dimension values (OLDEST LM) or it can be the latest date across all dimension values (LATEST LM). The timeline below represents visually what this looks like in reference to the current date. How the system determines which LM to use. Batch load data going back no more than. <Single fetch> is used to determine a specific dimension value the system should update and collect data for. <batch-fetch> allows the system to perform a bulk collection of all values with one query. These intervals represent the period the data is to be re-fetched for. They can be expressed in number of days, weeks or months – depending on the measurement interval chosen while creating the element. · For instance, if 5 is set in On data collection also re-run last interval, the data collector will also check for updates going back 5 days from the LM. · Batch load data going back no more than interval is ALWAYS disregarded when it comes to single-fetched data. Now, with a dimensioned metric, please refer to the attached file to see how the LM date is selected depending on the conditions involved. Prev: How do "Max Concurrent Threads" (Data Collection) and "Threads per Trigger execution" (Data Source) work together? Why is an element not updating even though the data exists in the data source? 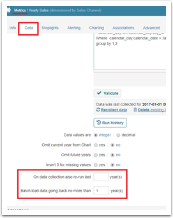 Report validation fails when declaring variable in SQL Statement field with the error: "DataCollector returned error: Must declare the scalar variable." What is the purpose of the "current collection cycle" setting for data/trigger dependencies? In what order are items processed during data collection processing? Why am I getting the error, "You can not initiate live-update of this report at this time because report generation has already been initiated by a different process"? I'm getting an "Error parsing DataCollector json result" while validating, collecting data, and updating charts. Why? How do you trigger data collection when data jobs at the source are finished? How does 'Insert 0s for missing values' work? Why am I getting a "Updating Report failed. You can not initiate live-update of this report at this time because report generation has already been initiated by a different process" error? How do "Max Concurrent Threads" (Data Collection) and "Threads per Trigger execution" (Data Source) work together? How do I re-issue an alert from the UI? Why is there an anomalous number of element views being logged in the dashboard database?